A very rare 14k gold napkin ring. This finely made napkin ring is engraved through a frosted yellow gold surface to rose gold. 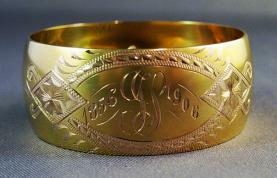 Engraved with the initials ‘JL’ and the dates ‘1856’ and ‘1906’. Undoubtedly a fiftieth wedding anniversary gift.